Posted in: Art, Music, Photography. Tagged: abstract, American, At the Risk of the Sun, Dream #9, Freud, John Lennon, Nelson-Atkins Museum of Art, Yves Tanguy. "Strange, organic forms appear in this dramatically illuminated, desolate landscape. A heart form can be seen on the right. To the left is an imaginative array of stacked shapes, referencing parts of human and animal bodies. 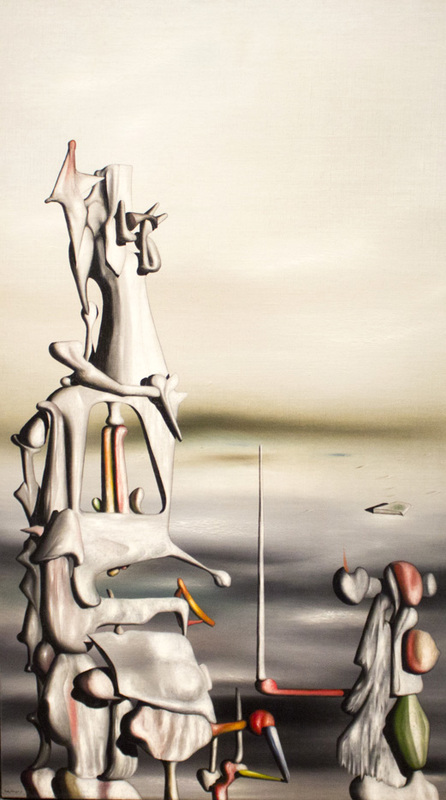 Yves Tanguy and other Surrealist artists sought to reveal the contents of the unconscious mind. Inspired by Sigmund Freud’s psychoanalytic theories, they depicted images from their dreams, nightmares, and memories. Tanguy based this image on the prehistoric stone monuments he saw as a child in Brittany, France." So the obvious heart shape on the right is pointed out then mention of reference to other human and animal body part shapes on the left which I don’t see at all. How an art was inspired by another art! A great choice to be posted here, Maverick! I don’t know anything about this artist, but this is a stark painting indeed. I am reminded of death, dried bones, and yet this has a mechanical aspect for me. I really appreciate the critique by Mia. Awesome.